What a Picture! 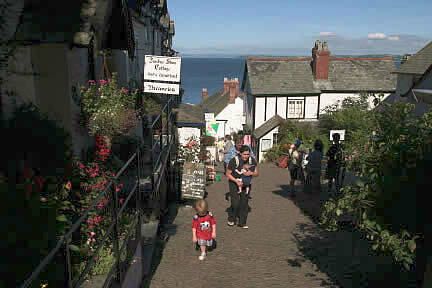 The tiny fishing village of Clovelly nestles beneath "Angels Wings" on the dramatic North Devon Heritage Coast. It hangs on a 400ft cliff less than five minutes drive from the main road. Follow the Atlantic Highway (A39) from Bideford towards Hartland and Bude. Turn right at Clovelly Cross Garage, this is Higher Clovelly and the road winds down, down and around. About half way down on the left-hand bend lies Clovelly Court, the ancient manor house of the estate, and the parish church of All Saints, which dates mainly from the 13th century. 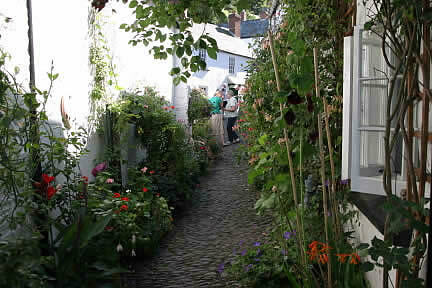 Clovelly Court's restored Victorian greenhouses and walled kitchen gardens are open to visitors. At the bottom of the hill take the right fork into the Visitors Car Park. The award winning Visitor Centre, modelled on a traditional Devon long barn, houses interesting souvenir shops and a café with stunning views over Bideford Bay. Take time to browse here, there are some large historical photographic prints on display and an array of books and leaflets about the village, the surrounding area and local flora and fauna. To make sure you don't miss anything we recommend you pick one of the beautifully illustrated Clovelly leaflets, which has a map of the village and a list of notable things to see. 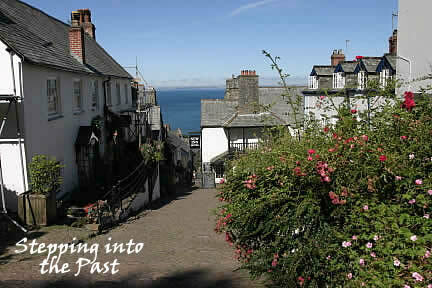 Visitors can also enjoy an audio-visual film which tells the fascinating story of Clovelly. Throughout the year thousands of visitors, from all over the world, are captivated by it's olde-worlde charm and little has changed since the author Charles Kingsley lived here as a child over 150 years ago. He returned here to write the novel Westward Ho! and find inspiration for "The Water Babies" The famous cobbled high street, called "Down Along" or "Up-Along" is built from pebbles from the beach and is so steep that for hundreds of years donkeys were the only form of transport. The donkeys are still very much a part of the Clovelly experience but they are only used for children's rides today and residents now transport all goods by sledge. There is so much to see why not stay awhile and explore the splendid coastal walks. You can really appreciate the stunning setting from high above on the coast path. Hobby Drive trails through the woods towards Bucks Mills and there are magnificent glimpses of the harbour languishing below. The coast path in the opposite direction affords more breathtaking views across Bideford Bay and this is where you will find the carved shelter named "Angel's Wings" as the path winds its way over the headland of Gallantry Bower and onwards to Mouth Mill Cove and Hartland Point. 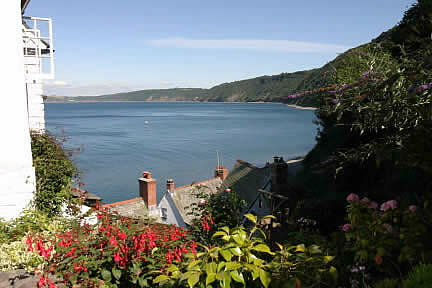 There are plenty of places to stay around Clovelly or in the village itself including the Red Lion down at the harbour or the New Inn at the top. As you enter the village you will be greeted by the famous iconic image of Clovelly which includes the sign for the New Inn. This scene has been captured by thousands of photographers and inspired many artists and illustrators. Why not experience the real thing!